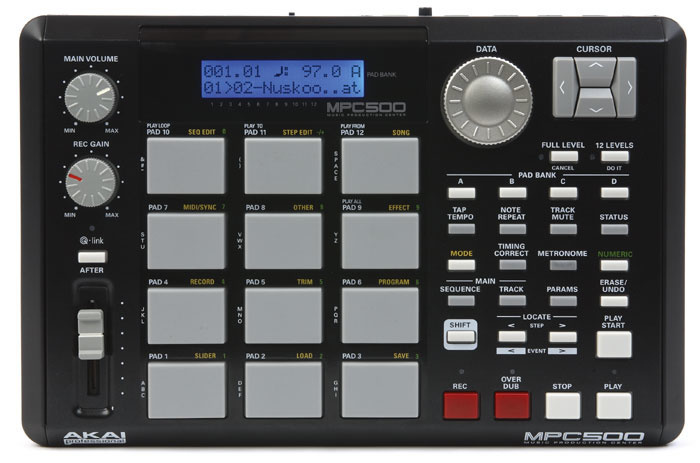 The MPC series of hardware sequencing and sampling workstations have an undeniable cachet in the field of hip-hop production, and the enormous success of this style of music in recent years has ensured their continued development well into an age otherwise dominated by computer-based MIDI + Audio sequencers. In SOS January 2007 I looked at the latest update on the 'classic' MPC feature set, the MPC2500, and was delighted to find that Akai had managed to introduce a set of important improvements without compromising the streamlined operation central to the unit's appeal. With interest in hip-hop at an all-time high, Akai understandably want to reach out to new customers. To this end the MPC4000 developed the concept way beyond the original MPC brief, using top-flight sampling technology from the company's Z-Series rack monsters, while the MPC1000 cut down the hardware and software options to hit a more entry-level price point. The subject of this review is the new baby of the family, the MPC500, which, although roughly a quarter of the size and weight of the MPC2500, still exudes a reassuring sense of robustness. Uniquely for the range, power comes via an external supply rather than an IEC mains lead, and as a nice side-effect of this cost-cutting measure you can also stick six AA batteries in the back if you want to 'keep it real' on the 6.55 to Peterborough. The core MPC features are all present and correct: drum sampler, MIDI sequencer, rubber velocity-sensitive pads, and audio and MIDI I/O. Some of the more recent refinements are also included, such as the Q-Link real-time controller slider, two basic multi-effects blocks (offering EQ, compressor, tremolo, phaser, chorus, flanger, auto-pan, reverb, delay, or lo-fi processor) and a master stereo effect providing simultaneous EQ and compression for the main audio outputs. Internal sample memory is 16MB RAM as standard (although you can upgrade to 128MB as a cost option) plus a further 5MB of internal Flash ROM which, although loaded with preset sounds by default, can usefully be overwritten with your own data instead. All files must be backed up to the Flash ROM or a Compact Flash card, via a slot on the front edge of the unit, if they are not to be lost on power-down. This slot can be accessed from a PC for file-transfer purposes via a rear-panel USB socket. A lot of the basic MPC functionality was covered in the SOS reviews of the MPC2000 (April 1997) and MPC2000XL (December 1999), and I dealt with more recent updates in my recent MPC2500 review, so I won't go over the same ground again here. Instead I'll look at what differentiates the smallest MPC from its larger siblings. Does 'Diet MPC' have the same great taste? The first thing anyone with any knowledge of the MPC series will spot is that the MPC500 only has 12 pads. Like those on the MPC1000, they're only 75 percent of the 'classic' height, but I actually quite like this, as I've always found the traditional MPC pad spacing a bit too wide. Fewer pads means that you only get 48 independent samples in an MPC500 Program, and it's also reflected in the reduced 48-track sequencer capability — the number of pads and sequencer tracks are linked by the pad-based Track Mute function. Naturally, the MPC 16 Levels function becomes 12 Levels here too. There's support for Compact Flash cards of up to 2GB in size. Also visible on the top panel is probably the most important way in which the MPC500 differs from it larger siblings: its display has been downsized to a two-line, 16-character LCD with switchable backlight (to conserve power when running from batteries). While I'd be the first to admit that the MPC2500's 240 x 64-pixel monochrome screen was hardly a graphical feast, it could still display a fair few controls and options at a time, it allowed waveform editing, and the software-assigned keys below it made navigating through internal parameters comparatively painless. With the MPC500 you get a plain alphanumeric read-out and you have to apply moderate elbow grease to the data dial and cursor keys to access a lot of basic parameters — sample assignment or filter cutoff, for instance. So you can forget waveform displays, drum-machine-style grid programming, or any sane type of MIDI list editing. That said, Akai's experience in designing this kind of operating system (remember the S2000?) shows through, in that they've sensibly tried to speed up operation by providing a lot of dedicated function buttons, as well as by having multiple functions for the drum pads. However, the degree of unavoidable menu-surfing required does still seem to me to undermine part of the unique selling point of the MPC series — simplicity and ease of use — so you should seriously consider saving a bit longer for the MPC1000 if this is a concern for you. While all the other MPCs have multiple outputs and at least two MIDI ins and outs, here you get just balanced stereo audio I/O on TRS jacks and single MIDI In and Out sockets. The digital connections available to the rest of the family have also gone AWOL. All of this seems fair enough on an entry-level machine, but I was a bit narked that there was no proper facility to route the analogue inputs to the main outputs for, say, monitoring a live MIDI module alongside your MPC samples — as it is you need an external mixer to do this. For the sake of a little extra OS code, Akai could have saved its target cash-strapped customer some money and hassle, so this seems a daft omission to me — and they can't plead ignorance either, because the feature (Input Thru) already appears on both the MPC2500 and the MPC1000. A much more practical cost-cutting move is the lack of built-in or optional hard drive or CD-RW burner. To be honest, I can't see many potential users complaining when there's support for Compact Flash cards of up to 2GB in size and it's child's play to transfer files to a computer via the rear-panel USB socket. I'd certainly rather have sacrificed these kinds of pedestrian extras than funkier things like the Q-link slider or Flash ROM. The Boss SP505 (£499) combines sampling and sequencing, and also gives you a decent waveform-capable display, but its more restricted polyphony and lack of battery powering might swing your vote against it. Korg's ESX1 is another option, but at £599 it's really competing with the MPC1000 rather than the MPC500, and its bias towards dance style may not appeal to hip-hop producers. However, I suspect that many potential purchasers are simply looking for the most affordable slice of the MPC mystique, and in this regard the MPC500 stands alone. I'd initially hoped that the cutbacks on the MPC500 compared with the MPC2500 would have been primarily hardware-related, but it turns out that a lot of the enhanced sound-mangling functions of the larger machine haven't trickled down either. I was particularly disappointed that there was only a single two-pole resonant low-pass filter per sample, as opposed to the dual multi-mode filters of the more expensive machines, and it appears that the filter envelope generator and LFO have also been culled. However, this pretty much brings the MPC500 back to MPC2000 spec, so it might not bother those already happy with what that machine can do. A number of other MPC functions are somewhat limited in their implementation: for example, the 12 Levels function can only control sample level and tuning, and only Q-Link data for filter cutoff, tuning and level are supported. The loop-slicing modes and Patched Phrase creation in the sample editor are also gone, although Patched Phrases created on another MPC will apparently play back correctly on the MPC500. For years, units like Tascam's Portastudios and Yamaha's Walkstations have been providing portable music sketchpad facilities, but neither of these options really suited the itinerant hip-hop beat-maker. The MPC500 remedies this for the very first time, and does it while retaining a remarkable amount of the functionality associated with its larger relatives. It also brings MPC2000-style facilities to a much lower price-point than ever before, and I can see this introducing budding hip-hop producers to the MPC approach at a much earlier age. Retaining the USB connection on this machine is a very canny move in this respect as well, because it encourages such users to keep the MPC involved with their music-making even if they start dipping a toe into computer recording and sequencing. What's great about the MPC concept, though, is that you could combine it with a second-hand digital multitracker and a Chinese condenser mic and put together something like a complete hip-hop production system for roughly £700 in the UK. Adding in a second-hand S&S MIDI keyboard would also make R&B more of an option, and you'd still probably have change from a grand. As a simple upgrade path for those more interested in the music than the technology, this takes some beating. For the more technically-minded, however, I can't help suspecting that Akai have deliberately hamstrung some aspects of the MPC500's OS, perhaps to avoid undermining sales of the larger machines. Is it just the entry-level user who might value the portability and compactness of the smaller hardware box? I, for one, would find an MPC500XL with better display, multi-mode filtering and LFOs very tempting as a beat-making sketchpad. Overall, though, I think Akai have made most of the right choices in squishing their classic MPC concept down from tabloid to hardback size. If you always wanted an MPC2000 but couldn't quite justify the outlay, this could well be the machine you've been waiting for. The most affordable way to lay your hands on the MPC sampling and sequencing feature set. Includes many of the more modern refinements seen in newer machines such as the MPC2500. USB connectivity opens up computer-based sample management and cheap backup. The small size and option to run from batteries make it great for portable beat-making. The smaller display affects how fast and easy it is to use this machine, which undermines one of the traditional advantages of using an MPC. Most of the great new sound-design facilities from the MPC2500's OS haven't been included. You will need an external mixer if you want to listen to the MPC's sounds alongside those of an external MIDI module. 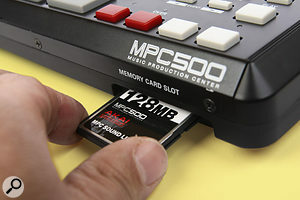 The MPC family's answer to the Portastudio, combining core MPC2000-style sampling and sequencing facilities with some of the refinements (most notably USB connectivity) from the MPC2500. Some might feel that the display and synthesis facilities have been cut down too far, but at this price the MPC500 is nonetheless a very attractive package for hip-hop production on a budget. Numark UK +44 (0)1252 341400.